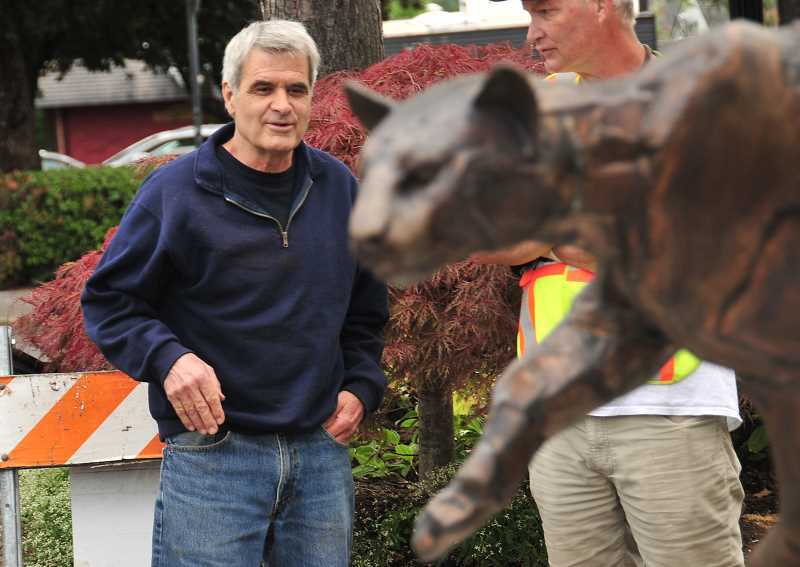 Steve Tyree is a quiet man, and the Amity-based artist didn't say much as volunteers from the Arts Council of Lake Oswego unloaded his 200-pound sculpture made of bronze and COR-TEN steel last week, placed it on a concrete pad in front of the downtown fire station and began bolting it in. But really, Tyree didn't have to say anything at all — his latest artwork, "Cougar on the Run," speaks for itself. The piece is large, standing at about four feet tall, yet it gives off an energy that feels nimble, agile and powerful all at once. So Tyree silently stood watch with his wife Toni as the crew, under the direction of Arts Council Executive Director Nicole Nathan, figured out how to place the sculpture so that it provides the best angle for pedestrians and cars passing by on B Avenue. "It's great (being chosen for the Gallery Without Walls)," Tyree said as the volunteers packed up their tools. 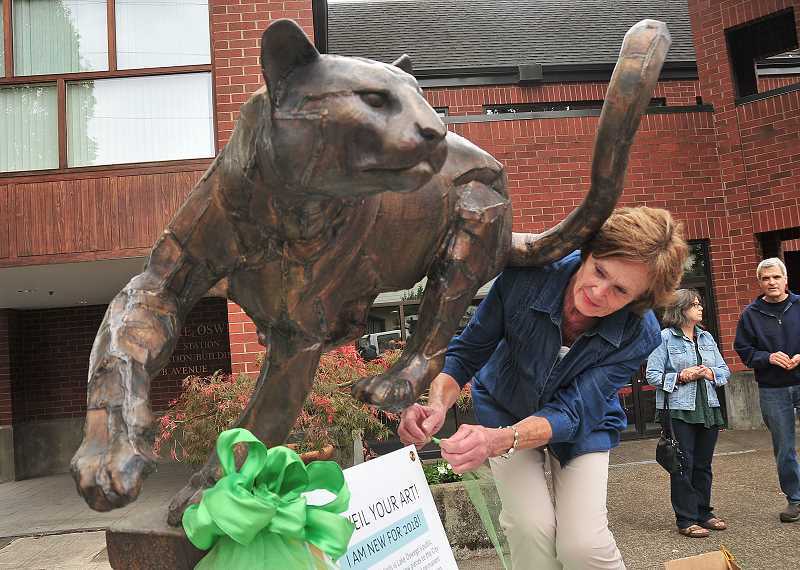 "Lake Oswego is the place to have work displayed." 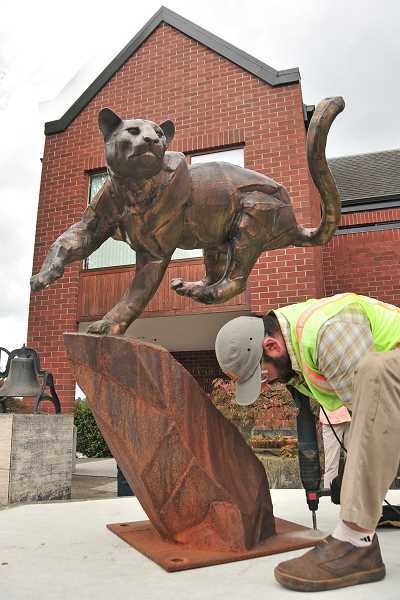 "Cougar on the Run" is one of 15 sculptures that the Arts Council is installing around downtown Lake Oswego this month as it prepares to reveal the newest additions to the city's Gallery Without Walls collection. That will happen at an "Unveil Your Art!" celebration, which is scheduled from 4-7 p.m. on Saturday, Aug. 25, in Sundeleaf Plaza (120 S. State St.). The free event will feature talks from artists, a drawing rally, dedication of the new sculptures and docent-led tours. There will be food, refreshments and family-friendly activities in a Kids Corner, too. "It's exciting to celebrate what's new," Nathan said. "Right in the center of the city, we're lauding creativity, artistic inspiration and visual arts education — what could be a better way to spend a summer Saturday?" Lake Oswego's award-winning public art program is unique in that 15 new pieces are loaned to the city each year and remain on display for two years as part of a rotating exhibit. The Gallery Without Walls also includes pieces purchased by the city for its permanent collection; all together, more than 70 public sculptures make their home in Lake Oswego. "I think it's a really special opportunity to be able to make art so accessible," said Stephanie Johnson, the Arts Council's new public art and program manager. "It's right on the street where people already are. They don't have to walk into a gallery or museum and pay money to see this art. It's just here. It's the definition of public art." As the crew finished drilling the holes and tightened the last bolt on Friday, Tyree walked around his masterpiece, viewing it from all sides. A small crowd gathered and began admiring the sculpture with him as Tyree talked about his inspiration. "I like doing animals because they're timeless, they're not dated," he said. "They can be posed in many different ways where you get these compositions. It's fun trying to balance them to make it look like they're in motion." "Cougar on the Run" is the perfect example of that. It's a dynamic sculpture that allows the viewer to get a closer view of what these majestic animals might look like in full sprint — while not putting themselves in danger of being mauled. Another of Tyree's pieces is already on display in Lake Oswego; his sculpture of a bear and its cub is part of the city's permanent collection and is on display outside the public library. "I work on several pieces at a time," he said. "(This) probably took me about two months." In all, nearly 70 artists submitted applications to the Arts Council for this year's collection. A selection committee reviewed the proposals over the course of several months, using guidelines that the Arts Council created in coordination with city officials when the program was launched in 1999. Although it's tough to wade through all of the great applications the Arts Council receives, Nathan said, the committee always focuses on finding works that help augment the gallery and provide a new point of view. "We want to have diversity of collection, and diversity of materials. You don't want 10 figural pieces or 15 abstract pieces," Nathan said. "You want a good mix that will appeal to a wide range of people — and not only the people who live here, but also those who come through and visit." For Arts Council board member Bonnie Cartwright, it's important that each piece selected for the gallery provokes thought and creates dialogue around not only the piece itself, but also the artist's process in creating it. Johnson hopes to evoke some of that when the Arts Council hosts "Unveil Your Process," a series of artist talks scheduled to take place between Aug. 24 and Oct. 19. In addition to meeting the artists, visitors to "Unveil Your Process" will get a chance to see the drawings, paintings, maquettes and mini sculptures that led to the creation of the final pieces. An opening reception is planned from 5-7 p.m. on Friday, Aug. 24, at the Arts Council's 510 Museum and ARTspace, located at 510 1st St.
"There's a lot of different materials in this year's Gallery Without Walls, and the artists come from a lot of different backgrounds," Johnson said. "A lot of them have really interesting backstories, and that will be interesting to pull out during 'Unveil Your Process.'" For a walking map or more information about the Gallery Without Walls, go to www.artscouncillo.org or call the Arts Council at 503-675-3738. When: Saturday, Aug. 25, from 4-7 p.m. Details: Family-friendly activities include a kid's corner, docent-led tours, an artist meet & greet, food and beverages, and a drawing rally featuring area artists. Sales from the drawing rally will benefit the Arts Council's education and outreach programs. Learn More: Go to www.artscouncillo.org.